How about a romantic engagement session to kick off the week? 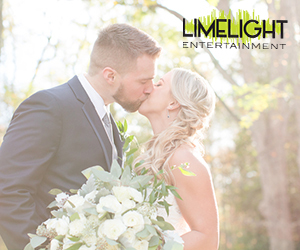 CWM vendor, Limelight Entertainment captured Jessie and Mike’s love story in downtown Red Bank, New Jersey and we’re just completely smitten with how their photos turned out. You can just tell by each and every photo that this adorable duo is all about having fun together. Just look at those smiles and the way they look at each other! This session is engagement goals for sure and we’re sharing all the details below. From Limelight Entertainment…Jessie + Mike’s engagement session at Riverside Gardens Park in Downtown Red Bank was amazing! It was a breezy, overcast day and the landscape of Riverside Gardens Park was so beautiful overlooking the river. Jessie and Mike looked amazing. They had brought with them two outfits and both looks complimented each other effortlessly. Jessie arrived in a long white lace dress that fit her stunningly, while Mike wore a navy blue suit that he paired with a blush pink tie and pocket square. Jessie’s second outfit was a super cute and pretty knee length floral dress with ruffles and Mike looked handsome in navy blue dress pants that he paired with a pale blue polo. Walking through Downtown Red Bank we stopped at a record store to take a few photographs. Mike loves and collects old records. It was very fun to experience this happy moment with these two while they looked around the shop and discussed music. We chatted about their wedding and what activities they like to do together. They told us they love trying new restaurants, opening a bottle of French wine and talking about anything and everything with each other for hours. Finishing up their engagement session, we had to stop at the restaurant where Jessie and Mike had their first date. We photographed them sitting at the exact same table! HOW CUTE ARE THESE TWO!?! Everyone inside was smiling and congratulating the couple. It was such a precious and exciting moment for the two of them. Jessie and Mike said they are so excited for their wedding day to have a chance to celebrate with everyone they love in the same place at the same time. They are also really excited to dance the night away.